But let’s not allow that to halt the updates! This is a Zanari Arcadian, a member of the Zanari species! Like the Griffinaire for the elemental griffins, it’s the only member you’ll be seeing on this blog since it’s the only one to appear early on. =) They tend to live in tropical areas—and although Miharu is pretty paradisiacal, it’s not quite tropical. The Zanari are capable of tool use, as you can see, but ultimately aren’t intelligent to the degree of even kobolds; you can expect decent power out of them, but not much in the ways of tricks. What’s an arcadian, you ask? They’re also shown from top to bottom in order of increasingly complex changes! 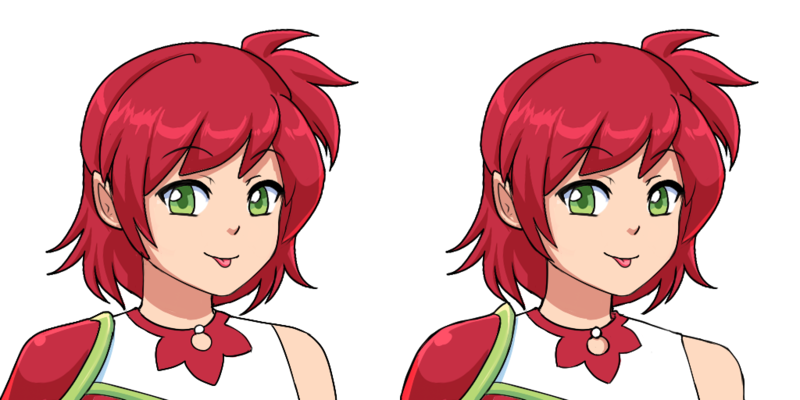 Astrid’s shoulder has been brought up a bit; Leaf’s shoulders also changed and her armor and collar have gained some depth and shading; Sakura’s portrait got zoomed out because she had much more of a close-up than the other characters until now. 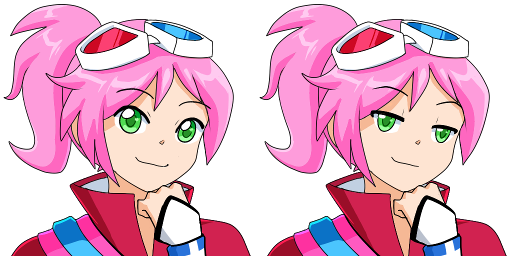 Speaking of the new page, Becca has finished more overworld goodies (and this should be the last of them for now) that I’ll be incorporating into the design of Miharu—and those will be up too with the rest of the pixel art collection and traditional art collection. Multiple artists here on my Dreamblazers project have singled out and commented on the cute and colorful world almost immediately after we started working together. And deservedly so! It’s a very prominent feature of the multiverse I’m creating. I’d also mention that it’s quite an optimistic world, at least in the sense that it’s not a cynical one. You’ll find no politics in the game, no blood, no drugs, no sexuality, and not even one instance of cursing. I hope I eventually have to run Dreamblazers through the ESRB and, when I do, I’m not convinced that the content rating will be even as “severe” as E10+. E10+ is possible and I have a few particular scenes in mind when I say that, but if The Legend of Zelda: Wind Waker can pass through and get an E rating twice then I’d like to think I’m fine. “If ever there was a post hoc ergo propter hoc…” she continues. Not every character has her vocabulary (not even close in most cases), but just have a look at the Dialogue page; in terms of subject matter, she’s in great company. Nearly every character talks about a very deep personal issue: causality and coincidence, free will and determinism, relational trust and vulnerability, the nature of anger, cowardice and courage, and what it even means to live. In my mind, the story of Dreamblazers isn’t for the young, but rather the young at heart. It might be a bit too much for those people who are still in the process of discovering who they are—though I could be wrong about their level of understanding and, in fact, I’d love to be wrong. Either way, though, it’s definitely for those who need to rediscover who they are. After all, rediscovering myself is just about my entire reason for creating the game. This entry was posted in Devlogs, Dreamblazers on September 28, 2015 by JellyPaladin. First up is the Griffinaire, the first in a line of elemental griffins—and the only one you’ll be seeing on this blog! Griffins are swift, powerful, and even capable of using magic, so they’re the kinds of creatures you don’t want to run into if you value your safety… but their wings and strength allow them to make their homes everywhere on the globe, so you’ll be running into them everywhere! Thankfully some of our heroines don’t value their safety at all. Next up is merely a teaser! I grayscaled out everything except the eye color of this mystery monster and had to crop it because it would give away even more than the last mystery monster if I didn’t, but someone who pays attention to detail might be able to guess what this is! Think I’ll have to cut this entry there for time constraint reasons… Becca has also passed along some updates to the overworld tileset that I’m eager to share, especially the newly-animated boat, but we have some more overworld updates coming up too and I’d rather hold off to show them all at once. This entry was posted in Devlogs, Dreamblazers on September 21, 2015 by JellyPaladin. So, uh, I recently got hit with a surprise $1500 house-related bill out of nowhere and there’s another $700 still pending that may or may not need to be paid. It was almost even worse than this to the tune of $780, but that one was resolved quickly enough to go without incident. This wouldn’t be all that bad except that I also have significant travel expenses coming up for a major event in a relative’s life happening in late December (one of the worst times for travel expenses). There’s a certain level of savings that I’m not willing to dip below if I can help it, so this represents a setback of about three weeks if not more. In other words, I’ll need to put in some extra hours at my day job for the next little while instead of plugging away at Dreamblazers. No no, I’m just kidding. :P Not about the money situation and how it affects me, but kidding about how it affects you, my dear readers. 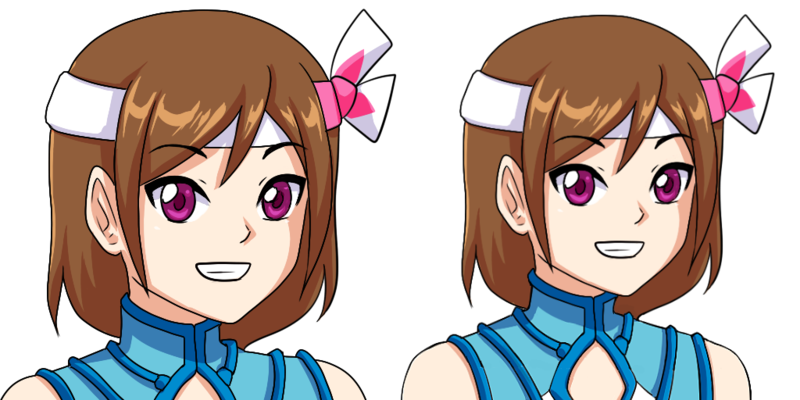 You shouldn’t notice a difference since I still get to update by posting the stuff produced by the rest of the team! Like… these! Oh, and that’s not all I’ve got to share! Yes, it’s the return of Flora. =) These portraits join some already previously-established collages like this one, this one, and this one. 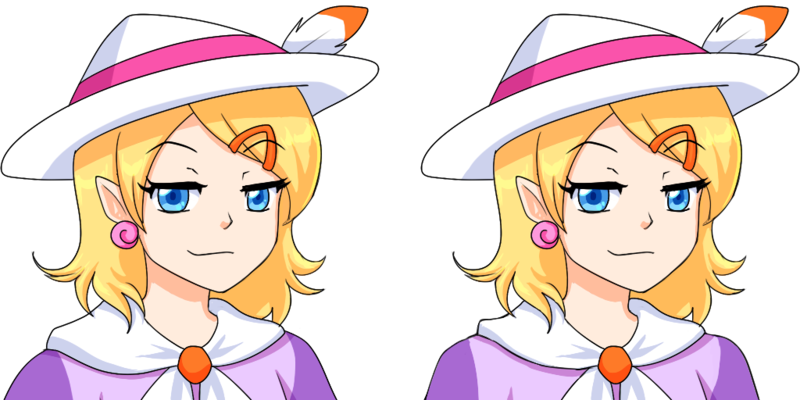 They were mostly inspired by some of Alex’s pixel art and translating that into portraits, but I also wanted a couple more expressions for the very expressive Ardis and felt that I needed a thumbs up for someone because somehow zero characters had one before. Celty’s hat-adjusting hand and Jig’s thumbs up can be used with any of their respective portraits for flexibility, much like Sakura’s prior hand gestures. As you might have realized by how many portrait collages I just had to link (and I wouldn’t even be surprised if I missed a few! 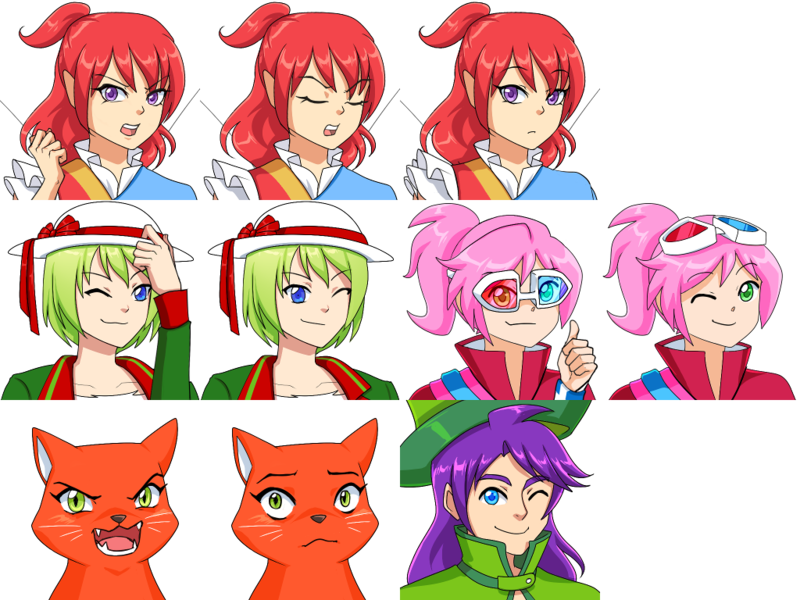 ), by now it would be really unwieldy for a newcomer here to go through dozens of past posts and see all the wonderful art assets that Flora, Becca, Alex, and Liz have created. So, as I find time, I’m going to make a page that collects all the art into one centralized location. The navigation bar’s already pretty occupied, but I’ll get rid of the dead weight (and outdated) Contact page and put that info on the Team page to free up room. Even the Characters page might disappear to be merged in with the new page; it’s kind of outlived its teaser usefulness for several characters now that I have assets to show that will actually be in the game, but it can’t go away entirely since it does feature full-body shots (minus eyes) and several characters who don’t have their portraits yet and won’t until a while down the road. This entry was posted in Devlogs, Dreamblazers on September 14, 2015 by JellyPaladin. I almost had nothing to share in today’s update; over this past week a long-time family friend wanted my help writing and editing in-depth text for multiple pages of a professional website, which ate up sixteen and a half hours and put a serious damper on getting anything done on the game dev side. I’m actually still not done, but the good news is that the reason I know the exact number of hours is because I’m being paid for my services, so hooray for more funding! And what is that funding going to? Why, beautiful pixel monsters drawn by Liz like this Archweaver! With its bright gold and purple body, the Archweaver has a rather regal appearance similar to, say, an archduke. :D Despite its size and power it’s a bit of a lazy and reclusive creature that poses little threat to the elves, sylphs, and other people of Peremene. Even if you get captured by an Archweaver, just remain calm! Archweavers aren’t killers; they only siphon energy until they’ve had their fill, so you can beat a hasty retreat afterward. Or are there better things to do? You see, some people let themselves fall into these spider clutches for monetary gain! Archweavers capture prey with powerful yet luxurious silk that can be repurposed for garments or used to connect bolas thrown by elven rangers and other forest hunters. A cunning and brave merchant can “sneak” herself into one of their lairs and walk away with a small fortune in barter material. After all, the resilience of archsilk far exceeds that of more ubiquitous silk from smaller insects and arachnids. 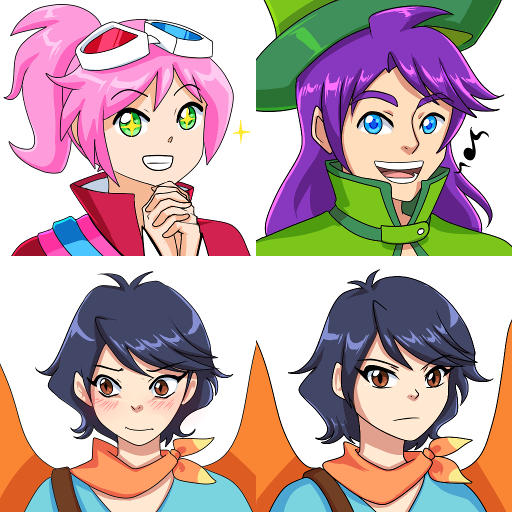 This entry was posted in Devlogs, Dreamblazers on September 7, 2015 by JellyPaladin.